If you’re struggling to ‘eat your greens’, this dish is for you. 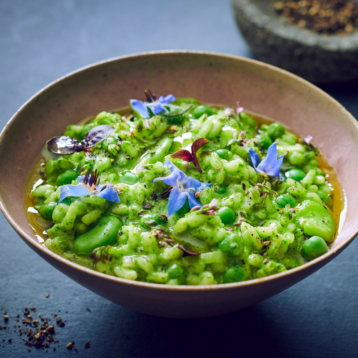 This risotto verde (which literally translates as ‘green risotto’) gets its magnificent colour from the key green vegetable ingredients: spinach, broad beans and peas. If you’re cooking to impress – the contrast of vibrant green looks beautiful topped with purple edible flowers. Garnish with edible flowers or micro herbs such as borage, micro basil, purple basil and oregano flowers for colour. In a food processor or blender, add the spinach and 2 tbsp of the hot stock; then whizz until a smooth purée is formed. Once the rice is almost cooked, stir in the purée, broad beans and peas, and season to taste. Cook for another couple of minutes, stirring regularly, until the peas have cooked; then turn down the heat and stir in the Parmesan, mascarpone and lemon zest.